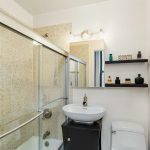 Perhaps the Homepolish-designed interiors were not enough to entice buyers, as the price of this Chelsea co-op at 221 West 21st Street has dropped to $599,000 since it was first listed for $665,000 in August. 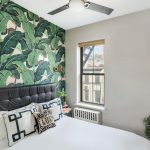 Last year, we featured the unit below, which was then owned by BuzzFeed coder & investment banker Will Nathan, who became a partner in the interior design startup after they redid his place. 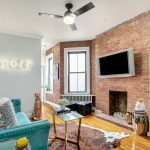 Looks like word spread around the building, because the interiors at this unit are just as chic and charming, with colorful accents popping against exposed brick walls and bold statement pieces. Like the look? These furnishings are available for purchase, too. 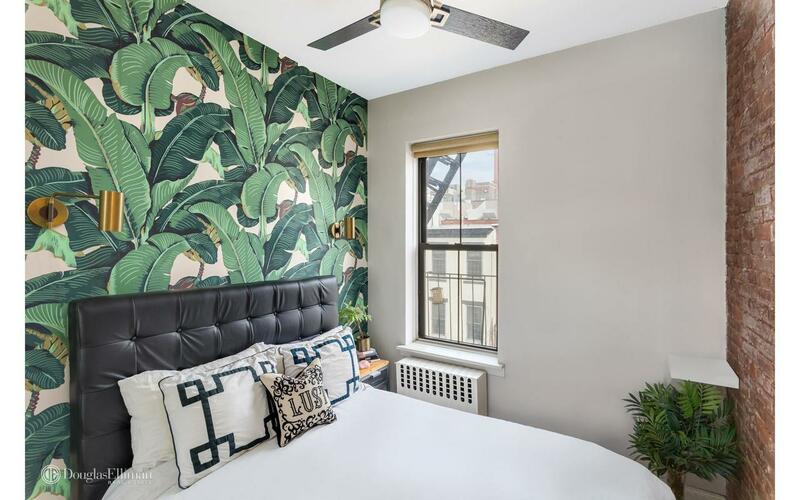 The long and narrow one-bedroom may not have a ton of square footage, but 9+ foot ceilings and an open layout make it feel much larger. 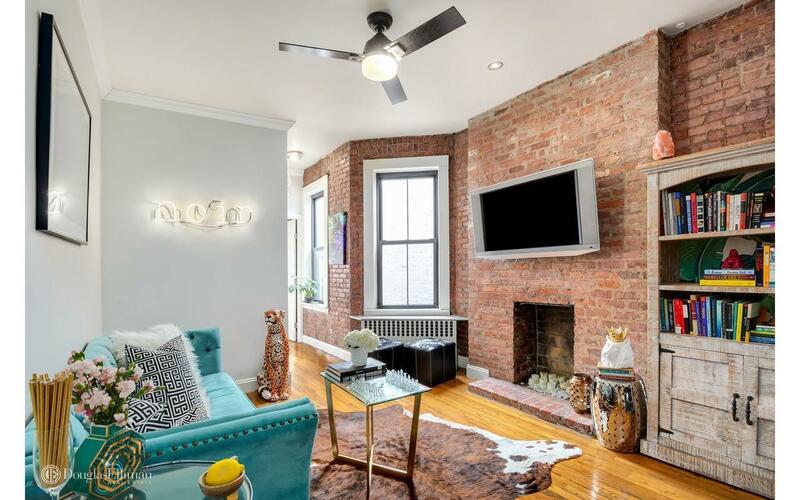 There’s also a decorate fireplace that can be turned to wood-burning, crown moldings throughout, and recessed lighting. 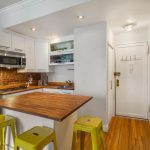 The kitchen has white lacquer and glass-front cabinetry, butcher-block countertops, stainless steel appliances including a dishwasher, and an island large enough for three stools. 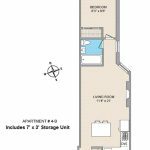 The bedroom is located down a narrow hall where the bathroom is. 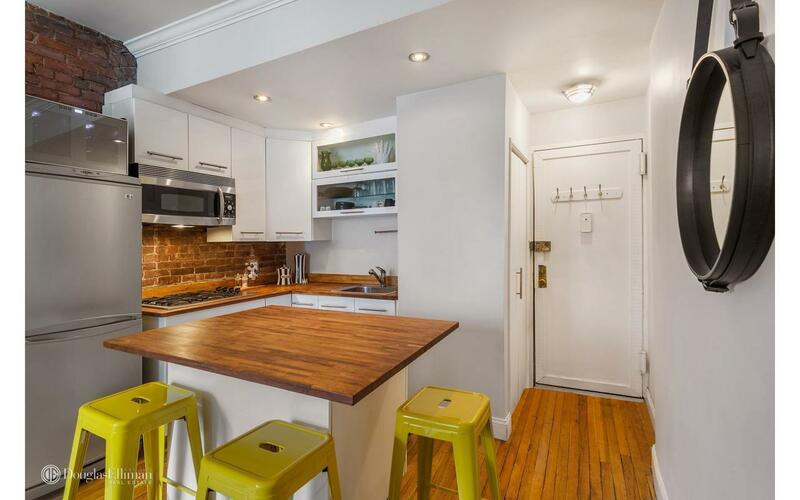 It gets a lot of northern light and “features an oblique view of the Empire State Building.” Other perks of buying this co-op are that pets, pied-a-terres, and co-purchasing are all permitted, as is subletting for up to five years.